Satori (悟 Japanese satori; Chinese: wù — from the verb, Satoru) is a Zen Buddhist term for enlightenment. The word literally means «to understand». It is sometimes loosely used interchangeably with Kensho, but Kensho refers to the first perception of the Buddha-Nature or True-Nature, sometimes referred to as » awakening». 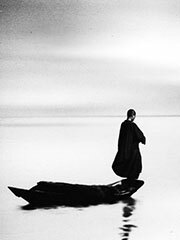 Kensho is not a permanant state of enlightenment, but rather a clear glimpse of the true nature of creation. Satori on the other hand refers to «deep» or lasting enlightenment.satori can be found in every moment of life, it is wrapped is all daily activities, it is goal to unwrap them to see satori. Think of a baby when it first walks — after much effort, it stands upright, finds its balance and walks a few steps (Kensho), then falls. After continued effort the child will one day find that it is able to walk all the time (Satori). Once the True-Nature has been seen. it is customary to use Satori when referring to the enlightenment of the Buddha and the Patriarchs, as their enlightenment was permanent. The transitory nature of Satori, as opposed to the more enduring Nirvana that is sought in the Buddhist traditions of India, owes much to Taoist influences on Chán Buddhism in China, from which Zen Buddhism of Japan evolved. Taoism is a mystical philosophy that emphasizes the purity of the moment, whereas the Hindu roots of Indian Buddhism lend a longer view toward escaping the Karmic prison of perpetual reincarnation in the material world.